What is the purpose of the Medical Residency Personal Statement? A personal statement is the sole document where an applicant is provided a blank slip of paper and has full control of presenting themselves to the Residency admissions committee. Your Personal Statement for Residency is not an exam that will score you or a LOR that will evaluate you. The Residency Personal Statement is your voice and solely a presentation of who you are. It should highlight not only why you chose that specific specialty but should serve to convince the reader that you would be an asset to said specialty, increasing your chances of obtaining an interview. 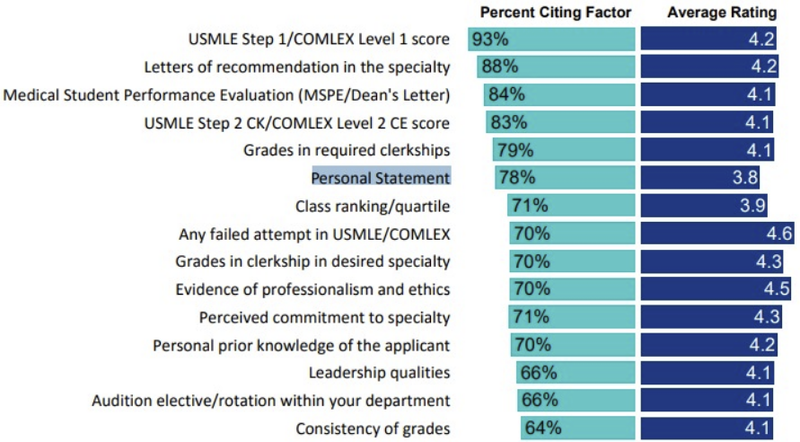 According to the NRMP 2016 Program Directors Survey, the Residency Personal Statement had a 78% citing factor and 3.8 mean importance rating in the selecting applicants for an interview. Your medical residency personal statement gives you the chance to make a good first impression on program directors before they even meet you! Program directors have reviewed your test scores, read your letters of recommendation, and are familiar with your CV. While all of those do play an important role in the applications process, your personal statement offers you a unique opportunity. You have to make sure that your statement adds something that none of these other documents have. This is your chance to show the reader just who you are. What makes you unique? What is it about you that makes you uniquely suited to their program? Are there special skills and talents will you be bringing to their program? As you can see no two candidates are the same. Hence, a residency personal statement needs to be unique and developed to present you and your voice. For these reasons IMGpreps editing team strongly advise against utilizing sample residency personal statements or writing services. You need to be involved in each step of the development process. Discuss your experiences! Let the reader know who you are and what you’ve done –and, more importantly, what you gained from it. Discuss those topics that don’t appear on your medical school transcript: How did your time in medical school prepare you to practice medicine? What practical knowledge did you gain from your rotations? And while your CV will list your work experience, your personal statement gives you the opportunity to answer some more questions. Your spelling and grammar must be impeccable. You’re applying for a respected and prestigious position; show the program director that you are a professional. If you aren’t confident in your English skills, ask a friend or mentor to look over your personal statement. And please, whatever you do, don’t rely on Microsoft Word’s spelling and grammar check. It can be a great tool, but only if you’re able to use your own judgment to decide when its advice is correct. Your personal statement’s content is equally important. Often, our clients will send us the statements they used previously (unsuccessfully), and these in some instances are fine. They are more or less grammatically correct, and they don’t break any rules, but that’s about it. Frankly, they’re boring. You need to remember that program directors see a LOT of personal statements. Do you really want them to skim (or skip) yours? Think good and hard about what information you’ll include in your statement: make sure it is interesting, compelling, and impressive. Is your statement ho-hum? Is it cliched? Choose anecdotes and examples that will bring your statement to life –that will bring YOU to life! Ask a friend to read your statement and give you his honest opinion: was he interested in it? Did he finish the statement knowing and feeling that you are a great fit for the specialty of your choice? At IMGPrep, we help our clients find their own voice. We won’t write your statement for you, and we won’t insert our ready texts into your essays. We don’t send out sample statements or use templates, since these result in unoriginal statements. We work with you to develop a unique and effective personal statement that highlights you as a candidate. IMGPrep’s writers will be more than happy to help you edit your statement for grammar, syntax, and organization. During the initial editing stages, your writer may pose brainstorming questions or suggest additional areas that you may wish to address in your statement. Your writer will strive to help you create a statement that makes a compelling argument for your candidacy, and that accurately reflects your own voice. All anecdotes, beliefs, and examples must be original and must be provided by the applicant. We thank you for your understanding, and we look forward to working with you!